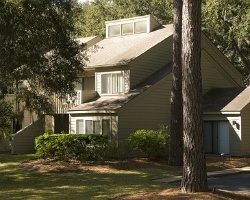 *Racquet Club Villas* is located just a short walk from Harbour Town in beautiful Sea Pines Plantation. The two- and three-bedroom, two-bath condominiums are all on one level, have spacious patios, and overlook either a lagoon or golf fairway. On-site are a large (unheated) swimming pool and four clay tennis courts. During the summer season, vacationers can take a trolley to the Sea Pines Beach Club. 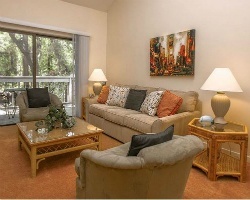 Rare resale opportunity at this lovely Hilton Head Island retreat! Don't miss out! Make an offer today! Weeks 7 & 8 are on same deed! Tennis courts are onsite and available for use at no charge! Buyer May Receive A Title Fee Credit, Inquire For Details! 4th of July week 26 annual summer season! 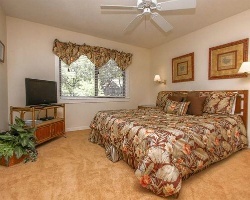 Come see the beautiful views of the lagoon or golf fairway! Buyer may receive a title fee credit!